Pour juices into a saucepan and sprinkle with gelatin. Allow to soak for a minute or two. Heat over low heat, stirring constantly, until the gelatin is fully dissolved (about 5 minutes). Remove from heat. Stir in the vodka and schnapps. Pour into a standard 1 lb loaf pan (about 9” x 5”). Refrigerate until fully set, several hours or overnight. To serve, cut into desired shapes. Garnish each jello shot with a few pieces of chopped lychee, if desired. Is the Lychee a nut, or a fruit? Does anyone out there know? All I know about Lychees is that they taste amazing, and most often come in a can – unless you live in South Florida, Hawaii, southern California and southern Texas - the areas in the United States which are the most climate friendly to this tropical crop. Apparently, the Lychee fruit does not ripen after picking – so if it is to be picked far enough in advance to survive shipment, it can be bitter tasting. Luckily, there is no real need for it to be fresh. The sweet and lovely Lychee is a quite extraordinary right out of the can.The fruit’s sweet, almost floral taste makes it an amiable companion for many liquors. My first Lychee Martini accompanied sushi several years ago, and I have noticed Lychee-based cocktails popping up on cocktail menus ever since. I recently concocted this Lychee Martini Jelly Shot recipe for the JSTK blog, and thought you might enjoy it too! The recipe is easy and perfect for patio dining – a refreshing accompaniment (or a gelatin alternative) to an aperitif. 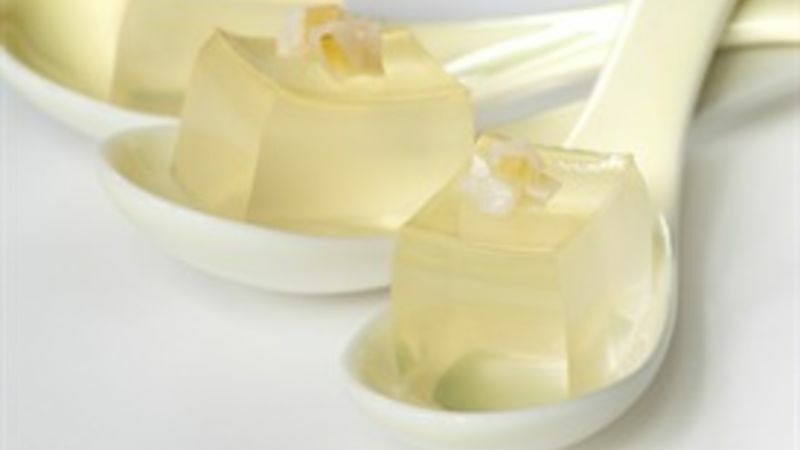 I love these jelly shots served in an appetizer spoon, with a little chopped lychee on top, or alongside. Another garnish option would be an edible orchid or other flower. Hope you enjoy Lychee Martini Jelly Shots!